As Warriors against Common Core, or any federal/P3 (public private partnership) overreach in education, we have seen many like-minded folks share need-to-know information. However, when a veteran Warrior speaks up, we MUST listen to the need-to-know information. Like any great military strategist, Senior officers can make or break your current efforts. With the 2016 elections being SO important to our States and our Nation. We SIMPLY MUST give credence to fact based evidence which points us to just HOW embedded the CCSS Machine is (and has been) for most, if not, all of our lives! We also must face the truth that not everyone against CCSS is being transparent or honest about their ties to the federally led, P3 usurping of education. A Veteran Warrior Speaks, Will You Listen? As you can see from the screen shot above, the veteran is none other than legendary Charlotte Iserbyt. Unlike some other ex-employees of the U.S. Dept. of Education, Mrs. Iserbyt has consistently, bravely, and factually shared the corruption, the deceiption, and the plots concerning educational reform. Like most truthful Warriors, she has had more than her share of being considered a fear monger. Since I am such a dedicated researcher, I know Mrs. Iserbyt’s findings are dead on target. So, while others choose to not listen, I, for one, am listening wholeheartedly. In the blog entry screen shot I featured as the source above, you can access Mrs. Iserbyt’s website. However, if you don’t have time to do so now, here is a brief rundown. 1) To the Presidential Candidates, a warning: Know the background of your education policy makers. She goes on to tell you how former Presidents didn’t check as closely as they should of and how many organizations (including Heritage Foundation) which have been steering us straight to an aligned, workforce based nation. It was no surprise to learn the Carnegie Foundation was included. Carnegie is also running rough shod over assessments. 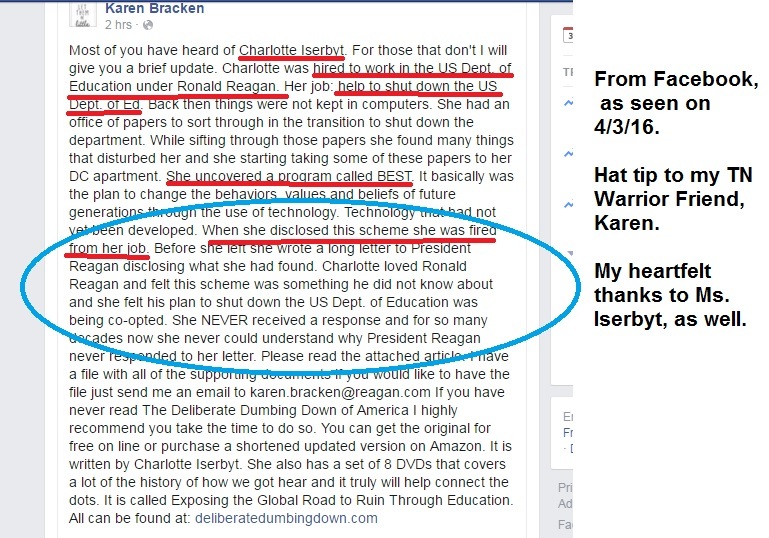 2) For those seeking the President’s Job, Mrs. Iserbyt gives them need-to-know information in the purposed path the U.S. Dept. of Education has been laying out since President Reagan’s service. Remember, he said the U.S. Dept. of Ed had to be shut down. However, it never happened! The facts and documents will tell you why/how. A warning of my own: Heritage and some other big name, supposedly anti CCSS groups are increasingly pushing the need for ESAs (Education Savings Accounts). Anti CCSS Warriors, and those opposed to the federal/P3 overreach in education, we MUST not only listen to veterans like Mrs. Iserbyt, we need to heed what other truthful Warriors have to say about ANY part of the efforts to streamline education for workforce purposes NOT true academics. If we are to fight this reform together, we MUST acknowledge where the evidence points us; expose those who are bearing a distorted message and ACT upon it! To do any less, is to be a part of the alignment of our education; not part of its solution. 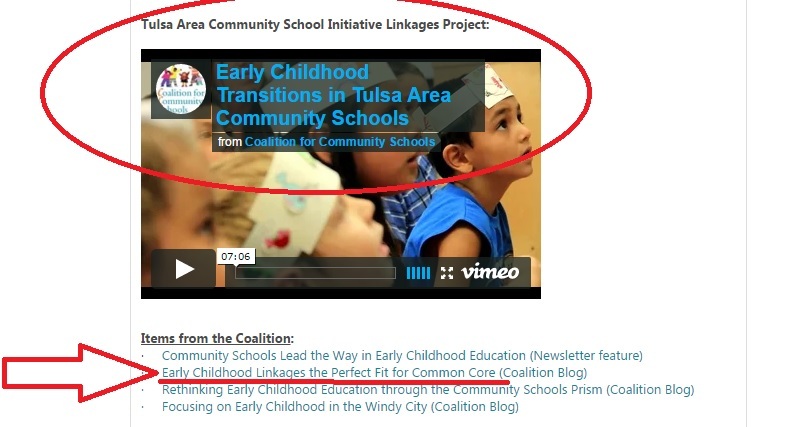 While that article will name the same groups below, this time I’m taking a much closer look at each of the lesser known groups involvement into CCSS aligned preschool. What is interesting, is the NIEER is housed in Rutgers University. 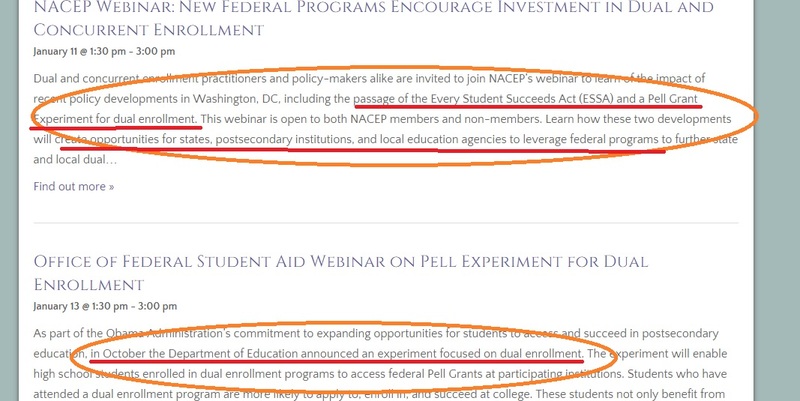 Before we get to HOW the NIEER influences early education, I think you might be interested in what groups fund the National Institute for Early Education Research. Other funders are below. Are the ‘other funders’ pro CCSS? Great question. Let’s find out! The Schumann Fund for New Jersey, before we delve into their ties, I wanted you to see the screen shot below. 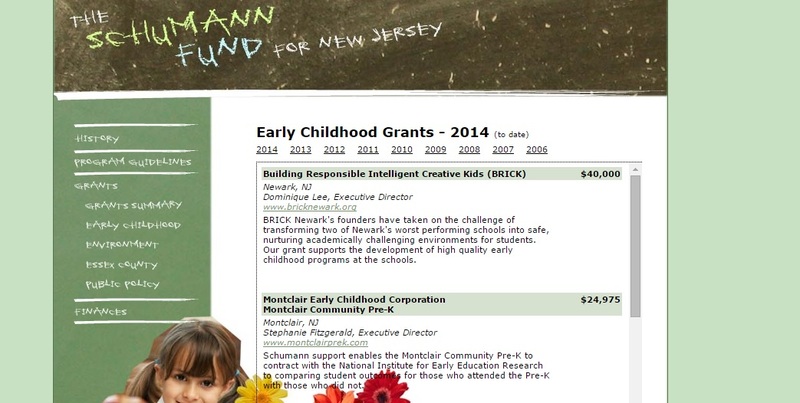 The latest grant is to an early education program named “Brick”. “Brick” stands for “Building Responsible Intelligent Creative Kids”. What you see above is from the Coalition for Community Schools. I’ve covered this Coalition in previously published articles. However, I’m including the most relevant one. I found buried in their publications and research this document which was presented in the ‘resources’ section of their newsletter detailing the re-authorization of the ESEA (Elementary and Secondary Education Act). This document was published by the National Association of Elementary School Principals (NAESP). The topic? “Making PreK to 3rd Grade Assessments Matter”. You won’t believe what you read. It is full of CBE (competency based education). CBE is a huge portion of not only CCSS, but CTE (Career Tech Education). You really should look at the entire July 2015 newsletter. Why? You’ll find a global investment summit where the topic was early childhood education; you’ll find a federal budget for early childhood learning; you can find studies, and links galore. A new pro CCSS report filled with the pro CCSS side’s version of truth is now available for we, the warriors, against CCSS. 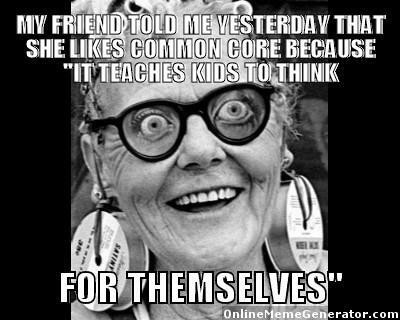 It’s amazing to me how the CCSS Machine and its operators will try to spin everything possible towards keeping the Common Core. Dr. Atkinson, especially. 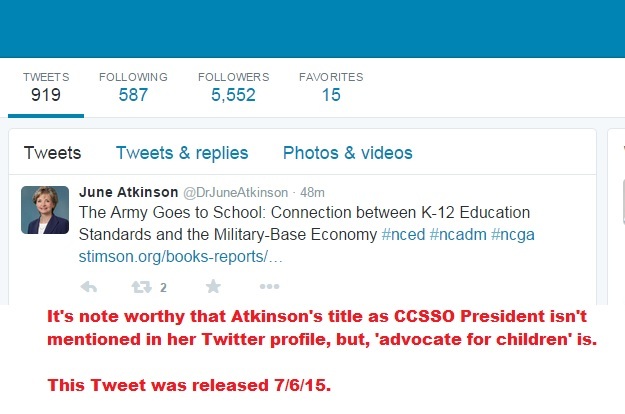 So why is she offering up the latest information about CCSS and the economy? Timing, my fellow warriors. With all the hub-bub in D.C., it makes sense to have one high profile, well known CCSS supporter suddenly ‘reveal’ a little known benefit to keeping CCSS.. boosting the economy of military bases..which indirectly boosts America’s economy. 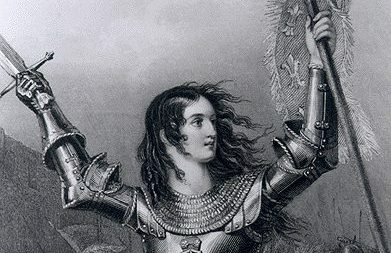 Alas, my warriors against CCSS, what have we discovered time and time again in this war? 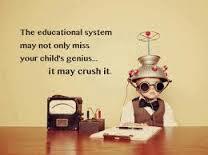 Economics is one of the major goals for the CCSS Machine, not an academic education! Warriors, take heart. We, as opposed to the CCSS Machine have been quite successful at not only handling the truth, but exposing it on a daily basis!! As long as the CCSS Machine continues to dis-serve our nation with their lies spun as truth, we WILL handle it. Why? Because we possess some things the CCSS Machine left in the dust years ago…. Great, more subjectivity for the CCSS Machine. What do I mean? Here’s a brief look at Stimson, New Venture, and the Collaborative for Student Success. “The entire debacle is un- Constitutional! It’s a domestic enemy! Every time you continue to allow Career Tech Education, rebrands of CCSS, Career Pathways, Workforce Education, high stakes assessments, textbooks that are rewritten to teach America is a hostile nation, YOU are the domestic enemy! Instead of keeping your oath to do all you can to protect, you’ve replaced it with a pledge to the CCSS Machine (all those fund, create, and continue to purport CCSS) The fact that federal funding has been accepted to help further align has happened of each of your ‘watches’ in office! How is that protecting the people OR defending the Constitution?! “I pledge my allegiance to the Core and to the deterioration for which it exists. I have pledged my support to the degrading of my people which CCSS ensues. Anti CCSS Warriors, just in time for the 4th of July, the latest ‘Zero to 3 State Baby Facts’ for each of the 50 states are out. So be ready to ‘rumble’! In Anti CC Warrior terms, the above means social and emotional learning, development, and the like are included. It means lots of policy makers and educational decisions are also being made. The Zero to Three Center is also connected to ‘Early Head Start’ (which is a community based, federally funded program). Between the two entities, all 50 states are serviced via over 740 programs. Home visitations are among these services. “What is the relationship between the EHS National Resource Center and ZERO TO THREE? The Early Head Start National Resource Center (EHS NRC) was created in 1995 by the Head Start Bureau and the Administration for Children and Families. Since its inception, the EHS NRC center has been operated by ZERO TO THREE in Washington, DC. The EHS NRC is a storehouse of early childhood expertise that promotes the building of new knowledge and the sharing of information. See the EHS NRC ‘About Us’ section or email ehsnrcinfo@zerotothree.org. How many programs does Early Head Start include? Early Head Start, a federally funded community-based program for low-income pregnant women and families with infants and toddlers up to age 3, has 745 programs in all 50 states, the District of Columbia and Puerto Rico. The program served nearly 62,000 children in 2004. For more information, please see the Office of Head Start Statistical Fact Sheets. Does ZERO TO THREE offer Early Head Start programs? The National Center’s funding appears to be a mixed bag of public/private funders. The website, Charity Navigator states that the Zero to Three National Center receives over 70% of its funding from the U.S. Federal Government. (see: http://www.charitynavigator.org/index.cfm?bay=search.summary&orgid=6562#.VZcYl_lViko) *NOTE: scroll down to the “Charts” graphics. Another example of the private donations, is the one from the Bill and Melinda Gates Foundation. See the screen shot below (the website address is included). According to the Center’s 2013 Annual Report (the latest available), our federal and state governments help fund it. This is important because you’ll see that part of the IDEA funds are used for Zero to Three; Promise Neighborhoods, and other trails that can lead you right back to the Dept. of Education and Common Core. I was able to locate the 2008 Zero to Three Annual Report’s list of donors. Among them are the Foundation for Excellence in Education (Jeb Bush’s pro CCSS organization), several U.S. Federal levels offices tied to the CCSS Machine in some way, The Casey Foundation, MetLife Insurance*, The Duke Foundation, and many others. See the screen shot below. For the entire report, use the website address provided beneath the screen shot. An online School Readiness tool is made available to you on the Zero to Three’s website courtesy of MetLife. My mother’s heart goes out to all the young mothers who will not know that the earliest years are not designed for these 4 skill areas. Before I share the 2015 State Baby Facts with you, I’d like you to see the picture below. The words you’ll see in red are mine (based on my extensive research into CCSS and CTE). If ever one picture was worth 1,000 words, this would be it. What you, as a CCSS warrior needs to know, is that early childhood care is going to be used (or is already being used) for school readiness. This intent is in the 2015 report. Back in 2014, the U.S. Dept. of Ed announced the Preschool Development Grant ‘winners’ and updated information for those Race to the Top States which had already been able to acheive ‘robust’ Preschools. The Common Core State Standards tie to the “NC Foundations” can be found on page 17 of the document. Warriors against CCSS, you know that usually on Saturday I’ve got action steps laid out for you. However, I think you can see what actions you need to take with this issue. Knock ’em down. I know I will do my gut level best! 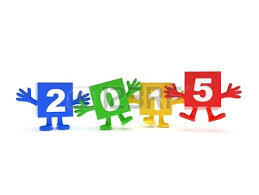 It’s been a good year, so far, to fight the CCSS Machine! In continuing to look back at the anti CCSS year so far, today’s article will share the best files I’ve been able to offer you in aiding your battle against Common Core. In no particular order, here are the ‘files’ most important and worth sharing again. This info packed article from March, 2015 gave you an in-depth look at how aligned to not only Common Core, but, Career and Technical Education this group is. 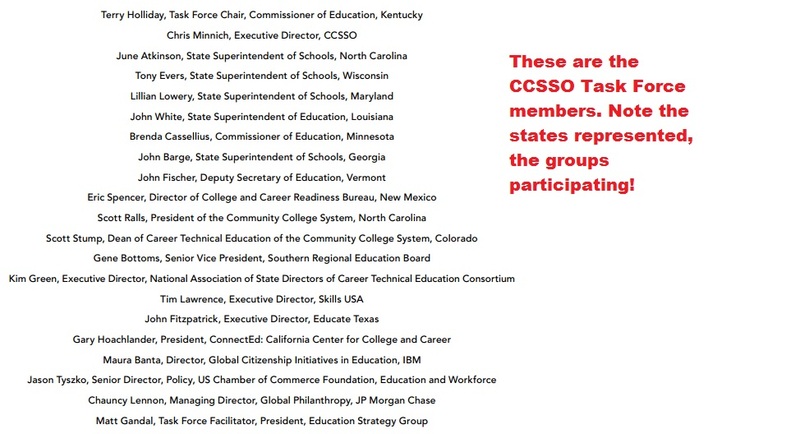 In it you’ll find connections to Pearson Publishing, Linda Darling-Hammond, Stanford University, and Sage Publishing to name a few pro CCSS supporters. You’ll also have access to the letter the AACTE wrote to Sec. 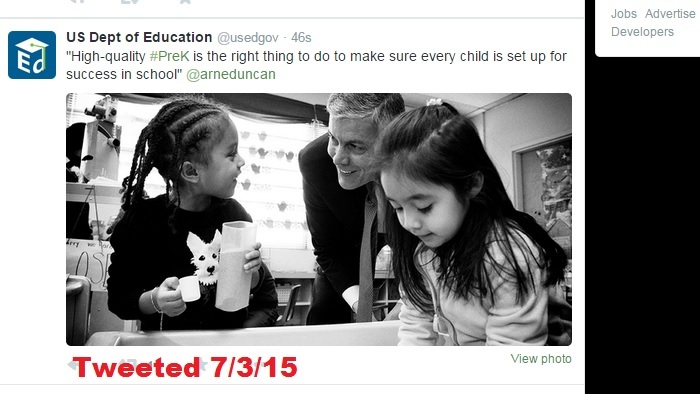 Arne Duncan! What do the massive data miners AIR (American Institute of Research) and an on-line library have in common? “Pathways to College” , as well as the Alliance for Excellent Education! 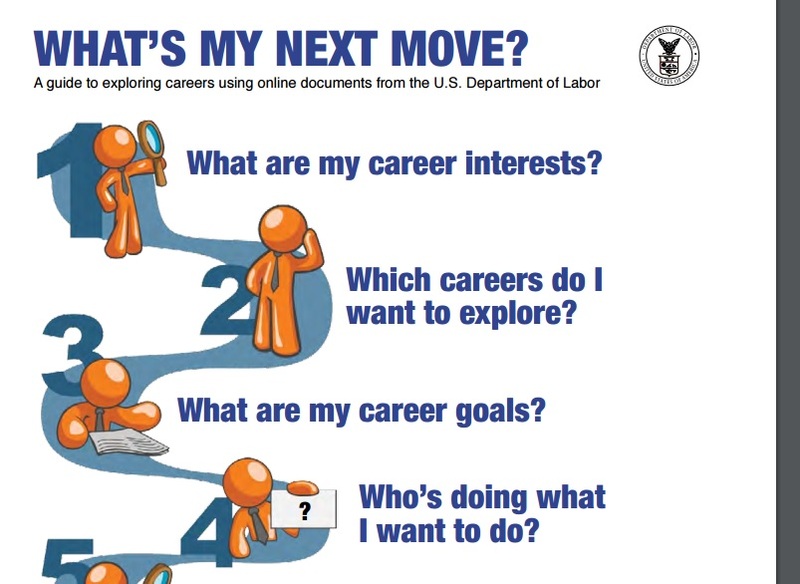 You might recognize Pathways to College is very similar to those like ‘Career Pathways’, ‘College and Career Pathways’, ‘Career Clusters’, and ‘Career and Technical Education’. Yes, ALL of these names are connected to Common Core. 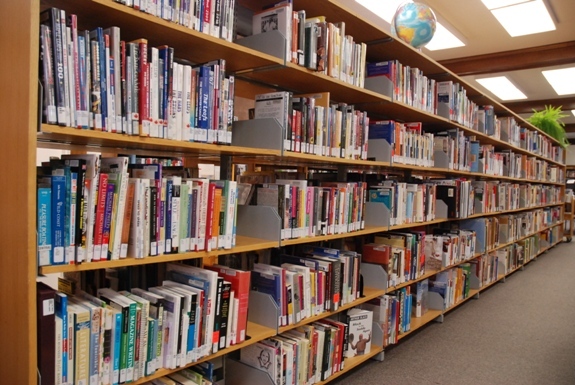 The online library featured in this article from February of this year will also share with you how Horace Mann’s philosophy of education is tied in. You’ll also get to know much more about those high stake assessments, too! From January, 2015, here’s another article with Linda Darling-Hammond, Career and Technical Education, and what is known as “Adult Common Core”. Yes, you read correctly..’adult CC’. You’ll also note, as I’ve stated many times, that while all 50 states may not of adopted CCSS, ALL 50 states have Workforce training, Career and College Readiness plans. In this article, I shared with you North Carolina’s current status in all this as an example of what to look for in your state; the Adult CC Caucus information on a federal level was also revealed in this published article. There’s lots to delve into the learn all you can about the plans to turn ALL our students (regardless of educational choice or age) into ‘talent supply’ to churn down the CCSS/CTE/CCR (Common Core State Standards/Career and Technical Education/College and Career Readiness) pipeline! The discovery of the Small Business Administration and its ties to Common Core, set a few readers and/or followers aback with shock. I shared all kinds of news, findings, and documents back in February 2015. So just how is the SBA tied to the CCSS Machine? Funding initiatives, business ventures, and capital investments. You’ll see pro friendly CCSS corporations like Apple, Intel, and Hewlett-Packard. Are there aspects about anything related to Common Core you’d like me to investigate to see what files are available? I’d be honored to dive into it for you, if you’d like me to. As you’ve been able to see from each of the articles above, I don’t tell you what to think, I point you to where to look so you can use what you need for your state’s fight in this war against the Core. What most pro CCSS groups would like us to look like and believe.